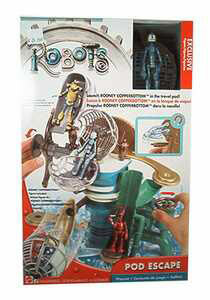 Description Of Item: From the makers of Ice Age comes this brand new animated movie ... Robots! With characters like Rodney Copperbottom and Fender. In the film you'll meet memorable 'bots Rodney Copperbottom (Ewan McGregor), a young genius inventor who dreams of making the world a better place; Cappy (Halle Berry), a beautiful executive 'bot with whom Rodney is instantly smitten; the nefarious corporate tyrant Ratchet (Greg Kinnear) who locks horns with Rodney; Bigweld (Mel Brooks), a master inventor who has lost his way; and a group of misfit \?bots known as the Rusties, led by Fender (Robin Williams) and Piper Pinwheeler (Amanda Bynes).